1. Mix olive oil and garlic in shallow dish. Mix other dry ingredients in similar bowl for coating. Dip chicken in oil, then in mix. Place in 9x13 baking dish. Cover and freeze. 1. Thaw completely. Remove foil and plastic wrap. Bake - 400 degrees for 20 minutes. Turn meat and continue baking for 20 minutes more. 2. While chicken is baking, heat sauce in pan. Pour sauce and sprinkle 1/2 cup of Parmesan cheese over chicken the last 5 minutes of baking. 3. Serve over spaghetti noodles. Trim all fat from chicken breasts. Flatten chicken breasts to 1/4" thickness. To do this, I lay a large piece of Glad Press 'n Seal on my counter. Place 4 breasts on top. Cover with another piece of Press 'n Seal. Seal well around the edges. Pound meat with a meat tenderizer. (I'm sure you can tell - Mine is over 20 years old!) Move chicken to a tray lined with waxed paper. I ran out, so I had to use foil. Foil works, is not ideal for later steps. Place tray in the freezer and flash freeze the chicken. This means, leave chicken in freezer until each piece is individually frozen. Place chicken breasts in a gallon size Ziploc freezer bag. Label and freeze. Heat oven to 400ºF. Brown meat with onions in large skillet on medium-high heat; drain. Stir in next 4 ingredients. Arrange 3 tortillas in single layer on bottom of 13x9-inch baking dish. Cover with layers of half each meat mixture, sour cream and cheese. Repeat layers; cover. Bake 40 min. or until casserole is heated through and cheese is melted, uncovering after 30 min. Let stand 5 min. before serving. Line 13x9-inch baking dish with foil, with ends of foil extending over sides of dish. Assemble recipe in prepared dish as directed. Cover with additional foil. Freeze up to 3 months. When ready to serve, bake casserole, covered, in 400ºF oven 1 hour. Remove foil. Bake an additional 15 to 20 min. or until casserole is heated through and cheese is melted. Let stand 5 min. before cutting to serve. To decrease the baking time, thaw frozen casserole in refrigerator overnight, then bake, uncovered, 45 min. or until casserole is heated through and cheese is melted. Bake 40 min. or until casserole is heated through and cheese is melted, uncovering after 30 min. Let stand 5 min. before serving. OR follow bake from frozen directions. Saute sausage and onion in butter in large skillet until onion is tender and sausage is golden around edges. Remove from heat. While cooling sausage slightly, layer green beans and potatoes in gallon size Ziploc bag. With slotted spoon, remove sausage from pan and add to bag. In same skillet (with remaining butter), stir in flour and salt until smooth. Gradually add milk and cook over low heat, stirring constantly with whisk. Bring to boil and boil for 2 min. Remove from heat and cool slightly. Pour sauce over contents of freezer bag. Allow to cool completely before sealing bag. Lay flat to freeze. Thaw completely. Transfer to large skillet (or stockpot) and heat until heated through. You may need to add a little milk if mixture becomes too thick. Assembly: Mix the fajita seasoning and 1 cup of water in a bowl. Combine this mix and the beef strips in a gallon Ziploc bag. Put the vegetables in a quart-size Ziploc bag. Freeze these bags. Serving Day: Thaw both bags. Put 1-2 tablespoon of oil in a large skillet. Preheat skillet. Put beef mixture in the hot skillet. Cook until brown. Remove beef. Put 1 tablespoon of oil in the skillet. Put the vegetables in the hot skillet. Cook until tender. Add the beef. Cook for a little longer. Scoop into tortillas, add cheese if desired. 1. In a large skillet, saute the mushrooms, onion and green pepper in oil until tender. Add tomatoes; cook and stir for 3 minutes. Stir in tomato paste; set aside. Combine cheeses and set aside. 2. On a lightly floured surface, divide dough into eight pieces. Toll each piece into a 7 in. circle. Spoon a scant 1/2 cup vegetable mixture and 1/4 cup cheese mixture over one side of each circle. Brush edges of dough with water; fold dough over filling and press edges with a fork to seal. Place calzones 3 in. apart on greased baking sheets. Cover and let rise in a warm place for 20 minutes. 3. Whisk egg and water; brush over calzones. Bake at 375 degrees for 15 minutes. Remove desired number of calzones from baking sheet and cool. Bake the remaining calzones 18-22 minutes longer or until golden brown. Serve immediately. Place cooled calzones in freezer bags. May be frozen for up to 3 months. Place 2 inch apart on a greased baking sheet. Bake at 350 degrees for 30-35 minutes or until golden brown. 1. Spray Covered Microwave Dish with olive oil, then add garlic and tomatoes. Cover; microwave on high 4-5 minutes. Crush tomatoes and put in gallon size Ziploc bag with broth, wine, chicken, salt and black pepper. 2. Put pasta in a quart size Ziploc bag. Coarsely chop basil and put in sandwich Ziploc bag with grated Parmesan Cheese. I then put all 3 bags in another gallon size Ziploc bag. Freeze. Microwave: Put broth mixture in covered dish with pasta. Heat in microwave 16-18 minutes or until pasta is tender, stirring after 10 minutes. Remove baking dish and add Parmesan cheese and basil mixture to dish. Mix and serve. Stove top: Put broth mixture in pot and heat till boiling. Add pasta, cook until pasta is tender. Add Parmesan cheese and basil mixture to pan and serve. In a large bowl, whisk egg and milk. Stir in the cheese, oats, onion and salt. Crumble beef over mixture and mix well. Shape into eight loaves; place in a greased 13-in. x 9-in. baking dish. In a small bowl, combine the ketchup, brown sugar and mustard; Pour into sandwich size Ziploc bag. Bake, uncovered, at 350° for 45 minutes or until no pink remains and a meat thermometer reads 160°. In a large saucepan, saute onion and celery in butter. Stir in flour, bouillon, dill, curry and cayenne until blended. Gradually add broth and milk. Bring to a boil; cook and stir for 2 minutes. Add the squash, salt and pepper; heat through. In a blender, process the soup in batches until smooth. Pour into bowls; sprinkle with bacon. Yield: 6 servings. Thaw, Heat through, garnish with bacon and serve. I doubled this recipe for our group. Blend cream cheese and 2 T. butter until smooth. Add next 5 ingredients and mix well. With pizza cutter, cut dough into 4 rectangles. (If using perforated dough, divide into 4 rectangles and firmly press perforations to seal). Spoon 1/2 c. chicken mixture onto center of each rectangle. Pull four corners of dough to top center of meat mixture and twist slightly. Pinch edges together to seal. Brush top with remaining 1 T. melted butter. Sprinkle with crouton crumbs. Bake at 350 for 15-18 min. or just to the point before they get browned. Cool completely. Freeze on cookie sheet. Once frozen, transfer to freezer bag. (If not freezing, bake at 350 for 20-25 min). Preheat oven to 350. Place frozen squares on cookie sheet and bake 35-40 min. until golden brown and filling is sizzling. Prepare macaroni and cheese according to package directions. Meanwhile, in large skillet, cook beef, green pepper and onion over medium heat until meat is no longer pink; drain. Add to prepared macaroni. Stir in tomatoes. Spoon half of the mixture into greased 9x13 baking dish. Sprinkle with cheddar cheese. Top with remaining macaroni mixture. Cover and freeze for up to 3 months. Place French's Fried Onions into a pint size freezer Ziploc bag. Freeze. Thaw completely in the refrigerator. Remove from the refrigerator 30 minutes prior to baking. Bake covered at 350 for 30 minutes. Uncover & sprinkle French's Fried Onions (or 1 cup of cheddar cheese) on top. Bake 10 more minutes, or until heated through. In a shallow bowl, combine corn flakes, Parmesan cheese, and salad dressing mix. Dip chicken in butter, then roll in corn flake mixture to coat. Place in a greased 9 x 13 baking dish. You can freeze at this point. When ready to eat, thaw chicken completely. Bake uncovered in 350 degree oven for about 45 minutes. Enjoy! 1. Saute chopped onion in hot oil in a large Dutch oven over medium-high heat for 5 minutes; add garlic - 1 minute. 2. Add turkey, chili powder, cumin, salt , and pepper - cook, stirring often, until meat crumbles and is no longer pink. 3. Stir in tomato paste - 2 minutes. Add tomatoes and cook for about 5 minutes. 4. Add the rest of the ingredients and bring to a boil. Cover, reduce heat to low and simmer, stirring occasionally, 30 minutes. *For your meal, I did not put in the chicken broth. You will need to thaw the chili and add the broth. Bring to a boil. Cover, reduce heat to low and simmer, stirring occasionally - 30 minutes. Combine first 4 ingredients in resealable bag and marinade in fridge for at least 20 min. If freezing, cook spaghetti noodles for 2-3 less minutes than the minimum time on the box directions. Drain noodles, run under cold water, then toss with sesame oil until coated, dump into gallon size Ziploc bag. In large skillet saute onion and broccoli (use a little cooking oil), until crisp tender, dump into freezer bag over noodles. In the same skillet, cook steak over med-high heat and saute for about 5 min, or until done. Dump cooked beef strips in bag over broccoli. Combine beef broth, oyster sauce, brown sugar, soy sauce (1/4 c.), cornstarch (1 T.), and ginger in small saucepan. Heat and whisk until all is dissolved, pour into bag over beef. Seal bag and freeze flat. Completely thaw. Pour into glass serving dish (9x13 works well). Pour 1/4 c. water into bag to get any residual sauce (plus, the dish needs more moisture). Heat in microwave for 5 min. Stir. Heat another 5 min. Stir and check temperature (adding additional time, if needed). Combine chicken and cooking sauce in a quart size Ziploc freezer bag. Freeze remaining ingredients in their original packages. Place all items in a large 2.5 gallon Ziploc bag and lay flat to freeze. Thaw chicken/sauce packet and tortelloni only. Keep peppers/onions frozen. Cook tortelloni according to package instructions. Keep hot. Heat oil in large skillet over medium-high heat. Cook peppers and onions until soft. Add chicken and sauce until heated through. Gently stir in tortelloni. Enjoy! Mix all ingredients in a casserole dish, cover with Mozzarella. Cover and freeze or Bake, covered if your cheese is browning too quickly, until browned and bubbly and heated through. Thaw completely. Preheat oven to 350°F Bake, covered if your cheese is browning too quickly, until browned and bubbly and heated through. 1. Combine beef, water and seasoning packet in a large mixing bowl. 2. Use your mixer on low to mix ingredients thoroughly. 3. Lay out a pieces of wax paper (or parchment paper) on a cookie sheet. 4. Scoop eight 1/2 cup portions of the beef mixture. Form into patties and place on lined cookie sheet. 5. Place cookie sheet of burgers into freezer to flash freeze. 6. When frozen solid, remove burgers from cookie sheet and place into a gallon size Ziploc freezer bag. To broil, put on greased broiler pan for about 6-7 minutes on each side. To grill, cook over medium heat for 20 minutes or until cooked to your liking. Add cheese, lettuce, tomato, mayo, or whatever you like on your burger! 1. Stir the onion flakes, beef bouillon granules, onion powder, parsley flakes, celery seed, paprika, and black pepper in a bowl. Use as substitute for a 1-ounce envelope of dry onion soup mix. Take out bag of noodles from the Chicken Helper and set aside to use on day of serving. In large skillet, melt butter over medium heat. Cook chicken until no longer pink. Remove from heat and add the water, milk, broth, soup, and sauce packet from the Chicken Helper. Stir until combined (no need to heat this up if freezing). Add frozen veggies. Carefully pour into gallon Ziploc bag. Lay flat to freeze. Thaw above bag and pour into large skillet. Add the noodles (from Chicken Helper as well as an extra 1 c. of wide egg noodles). Bring to boil and simmer for 12 minutes, or until noodles are tender. Meanwhile, prepare biscuits as instructed on can. Serve chicken noodles over an open Grand biscuit. Optional Ingredients: To be put with meal AFTER IT IS COOKED! 1. Make a "rub" with the 4 spices and rub on the chicken breasts - place in a crock pot. 2. Add the other ingredients (except chips and cheese) and mix. 3. Cook on low for 10 hours or on high for 3-4 hours. Shred chicken during the last hour of cooking to give the meat more flavor. 2. Pour into Ziploc freezer bag. *For our group, you will need to thaw ingredients and then start at #3 under "Steps". 2. Heat mixture and serve over rice with shredded cheese on top or just eat with tortilla chips. Note: If freezing place roll-ups in a 9x13 aluminum pan. Thaw, Bake uncovered 30 minutes or until heated through. Brown meat in skillet and drain. Mix soup and seasonigs with meat. Transfer to greased 9 x 13 baking dish. Layer cheese on top of meat mixture, breaking cheese to cover entirely, if needed. Layer frozen fries on top of cheese. Cover and freeze. Completely thaw casserole. Bake at 350 for 30 min. Then, increase heat to 400 and continue to bake until fries are crispy and meat mixture is bubbly (15-20 min). Serve with ketchup and mustard, if desired. In a large saucepan heat oil and butter over medium heat; add onion and cook until translucent. Add soup, milk, ham, salt and pepper and stir well; remove from heat. Cover bottom of a 9″ x 13″ aluminum foil baking dish with frozen potatoes and pour sauce evenly over the top. Cover with Press and Seal wrap and then cover with a layer of aluminum foil. Label and freeze. Thaw completely. Remove all wrap. Bake uncovered at 350 degrees for 40 minutes. Rinse the roast with water and pat dry with paper towel. Mix seasonings (brown sugar, paprika, salt, and pepper). Rub the seasoning mixture all over the roast. Heat a large skillet over medium high heat. Sear the pork roast on all sides then place in crock pot. Completely cover roast with root beer (you will not use the entire 2 L). Cover and cook on low for approximately 8 hours. Remove roast from crock pot and allow to cool enough until able to handle. Shred the pork into pieces, removing fat, and place into large bowl as you work. When done shredding all the meat, add BBQ to your desired level of sauciness. I also used some of the root beer broth to help moisten. This part is dependent on your own taste. Transfer from bowl to gallon size Ziploc bag. Lay flat in freezer. Thaw completely. Transfer to glass dish and warm up in microwave or in large saucepan on stove top. Serve on hamburger buns. *If you use a boneless pork loin roast, the meat will be harder to shred (although healthier). Fattier cuts will shred much easier. 1. Cook pasta in large pot as directed on package, omitting salt and adding spinach to the boiling water for the last minute. 2. Meanwhile, cook and stir chicken and basil in large nonstick skillet sprayed with cooking spray on medium-high heat for three minutes. Stir in tomatoes and spaghetti sauce; bring to boil. Simmer on low heat for three minutes or until chicken is done. Stir in cream cheese. 3. Drain pasta mixture; return to pan. Stir in chicken mixture and 1/2 cup mozzarella; pour into 9x13 foil pan sprayed with cooking spray. 2. Remove plastic wrap and foil before placing pan in a preheated oven - 375 degrees. 3. Bake for 20 minutes or until heated through; top with remaining cheese. Bake three minutes or until mozzarella is melted. In a large bowl, mix the cream cheese, salsa, lime juice, ground cumin, chili powder, onion powder and garlic. Once combined, stir in the cilantro and green onions. Add the chicken and cheese; mix thoroughly. Spoon 2-3 Tablespoons of the chicken mixture onto the lower third of a tortilla. Roll the tortilla as tightly as you can. Place the rolled tortilla seam side down on the baking sheet. Repeat with remaining tortillas until the mixture is gone. Spray the tops lightly with cooking spray and sprinkle with kosher salt. Flash freeze taquitos in a single layer on a baking sheet until hardened. Place in Ziploc freezer bag and freeze flat. Bake from frozen. Preheat oven to 425˚F and bake for 20 minutes. Cover loosely with aluminum foil if browning too quickly. Serve with salsa, sour cream or guacamole, if desired. Cut skin and fat off of chicken, rinse with water, and place in single layer in greased 9x13 baking dish. Salt and pepper chicken. In small bowl, mix the soups. Cover chicken with the soups and sprinkle cheese on top. Cover and freeze. Thaw completely. Bake, uncovered, at 300 for 3 hrs. Serve over rice. *For the rice, bring 3 cups water to a boil. Add 1 T. butter and 3/4 tsp. salt. Stir in rice. Reduce hear, cover and simmer for 20 min. Let stand covered for 5 min or until water is absorbed. Fluff with fork. *This is Jen's original recipe with a few adjustments to assembly and serving instructions. Pour pineapple chunks and juice, teriyaki glaze, frozen vegetables and frozen meatballs into a gallon size Ziploc freezer bag. Freeze flat. Thaw completely. Pour meatball mixture into a 9x13 baking dish. Bake covered at 350 for 30-45 mins. Serve over the cooked rice. Add rice and 3 1/3c. water in a saucepan. Add butter and salt if desired (I use 1 tablespoon butter and 3/4 tsp. salt). Stir and bring to a boil. Lower heat to simmer. Cover and simmer for 20 minutes or until all water is absorbed. Remove from heat and let stand covered for 5 minutes. 1 tablespoon butter and 3/4 tsp. salt). Stir and cover. Cook on Meduim (50%) power for 20-25 minutes. Remove from microwave and let stand covered for 5 minutes. Assembly Line baking pan with buns. Remove tops of buns and set aside. Layer ham evenly on all buns. Layer cheese evenly on all buns. Place tops of buns onto the sandwiches. In small bowl, mix butter, mustard, Worcestershire sauce, poppy seeds and onion. Pour mustard mixture evenly over buns. Serving Day Preheat oven to 350. Place in oven directly from freezer (REMOVE PLASTIC WRAP FIRST). Bake covered for 40 minutes. Uncover. Bake another 5 minutes. **Can use Kings Hawaiian rolls in place of slider buns. ***This makes a great appetizer for parties too! Fry bacon in stockpot and drain. Pour water in the same pot (to get flavor from the bacon). Add potatoes and onions and cook until potatoes are tender. Stir in remaining ingredients. Pour into gallon size bags (2 bags works best). Freeze flat. Thaw completely. Heat up in stockpot, but do not bring to boil. Or, pour in crock pot and heat slowly throughout the day. Note: Substitute 12 regular lasagna noodles, broken into small pieces, for the oven-ready noodles. Increase water to 2 cups and cook 30 min., stirring occasionally. Prepare meat mixture and pour into ziploc bag. Make sure you add 2 cups of water if you use regular lasagna noodles. In another 2 ziploc bags, place broken lasagna noodles and cheese. Thaw, pour bag of meat mixture into a large skillet. Bring to boil. Stir in noodle pieces; cover. May need to add 1 more cup of water if skillet is too dry. Cook on medium-low heat 30 mins or until noodles are tender, stirring occasionally. Remove from heat. Sprinkle with cheese; cover. Let stand 5 min. or until cheese is melted. This recipe is adapted from the original recipe in Fix-It and Forget-It Cookbook. Mix all ingredients, except stew meat in a gallon Ziploc freezer bag. Add meat and mix. Lay bag flat to freeze. Thaw completely. Place in slow cooker. Cook on low for 8-10 hours. Serve over rice or noodles. Thaw enough to remove contents from Ziploc and place in slow cooker. Cook on low for 10-12 hours. Serve over rice or noodles. Freezer Friendz: The rice that I gave you is regular long grain rice. I put instructions on your bag about how much water to add. Bring to a brisk boil. Turn heat down very low. Cover. Simmer 15-18 minutes. 1. Place meat in ziploc bag. 2. Top with onio soup mix, mushroom soup and Pepsi. 2. Pour content of bag into crock pot. 3. Cover. Cook on High for 6 hours. *You can peel and cut potatoes to put in the crock pot during the cooking time. Put frozen tortellini in boiling water for about 3-5 min, drain. Place in bottom of greased 9x13 pan. On top of noodles, sprinkle ½ c. cheese and then chicken. Cook onion in saucepan with butter until tender, add flour. Gradually whisk in bouillon and chicken broth and bring to boil over medium heat. Boil for 2 min. Add soup, mushrooms, sour cream and 1 c. cheese. Pour sauce over chicken/noodles, sprinkle with remaining ½ c. cheese. Cover pan with a layer of plastic wrap and a layer of aluminum foil. Freeze. Thaw completely. Bake at 350 for 45 min. or until golden and bubbly. Dip pork chops in egg. Coat both sides with Fresh Take mix. Place flat in gallon size Ziploc freezer bag, so that no pork chops are stacked. Freeze flat. Thaw completely. Bake on 375 for 28-30 minutes or until cooked through. DO NOT turn during baking. *If pork chops are thinner, cook for less time. Combine stuffing mix and water. Pour in 8x8 Pan. Top with seasoned chicken tenders. 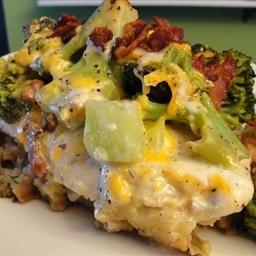 Top chicken with broccoli. Top broccoli with cheese. Crumble bacon over cheese. Drizzle with Ranch dressing. Cover with foil. Freeze or bake at 400 degrees for 1 hour. Thaw completely. Bake at 400 degrees for 1 hour. One question that I get a lot is, "What does a freezer swap look like?" We captured our swap with our camera this time so you could see for yourself. This is the swap we just had on Friday. There are currently five members of our group. Each member cooks the same meal five times. She keeps one and brings one for each of the other four members to the swap. You may notice that the person on the end did not get the buns. That is my pile. I made the meal with the buns, so I already had my meal in the freezer. As you can see in the photo, we have a tent card for each member. When a member arrives for the exchange, she brings her cooler inside and starts placing a meal next to each member's name card. After all members have passed out their food, we all start to pack our coolers. The whole exchange takes about ten minutes if everyone arrives on time. Most of the time we all leave and go on with our day. Occasionally, we may make it a bit more of a social time. Our swap occurs once a month. It is always held at the same house, on the same day of the month (2nd Friday) and at the same time. Keeping things consistent helps to eliminate confusion and ensures that no one will get frustrated by constant changes to the schedule. We have 2 full time teachers in our group. They cannot attend the exchange because we hold ours during the school day. No biggie! They just drop off their meals to one of our members to bring for them. They then arrange to pick up their coolers full of food at a later time. It works beautifully. Do any of you do a meal swap? Is yours similar? We'd love to know how you conduct yours! You can find the recipe and leave comments at the following link. Enjoy! In a small bowl, combine dry ingredients. Place pork evenly on plastic wrap. Rub spice mixture evenly on pork. Bring up the sides of the plastic wrap to enclose pork. Freeze. Preheat oven to 325 degrees. Line a baking dish with foil and coat foil with nonstick cooking spray. Unwrap pork and place on baking sheet. Coat pork evenly with non stick cooking spray. Cook loin for 1 1/2 - 2 hours. Internal thermometer should read 160 degrees. Remove from oven, cut and serve. The original recipe is from Fix-it and Forget-It Cookbook and was written by Mary Seislstad. I have made slight adjustments for freezing. Place chicken in gallon Ziploc bag. Mix remaining ingredients in separate bowl and pour over chicken. Freeze standing up, so it will fit in the crock pot when you are ready to cook. Cook from frozen. Remove plastic bag from frozen meal. Place meal in crock pot. Cook on low 10-12 hours. Serve over cooked egg noodles or rice. Freezer Friendz: I included egg noodles. Saute in butter-onions, carrots, celery until tender. Add garlic and cook 1-2 minutes more. Add chicken broth and potatoes, bring to a boil, and cook until potatoes are tender. Mix flout with water, add, and simmer until soup is slightly thickened. Add milk, broccoli and cook until broccoli is tender and soup is heated through, about 30-45 min. Stir in cheese, allow to melt and serve or cool and freeze in gallon Ziploc bags. Thaw bag and reheat until hot. In a large bowl, whisk egg and milk. Stir in the cheese, oats, onion and salt. Crumble beef over mixture and mix well. Shape into eight loaves; place in a greased 13-in. x 9-in. baking dish. In a small bowl, combine the ketchup, brown sugar and mustard; spoon over loaves. Thaw, Bake at 350 for 45 mins. Our site and many others are experiencing issues with Internet Explorer. This is not something that Freezer Friendz can fix, but hopefully IE will fix it soon. If you are clicking on a recipe and it disappears after a brief appearance, you may need to temporarily access the site through another browser. You can download Firefox or Google Chrome for this. So sorry for the inconvenience that this has caused. 1. Place chops into a gallon sized Ziploc bag. 2. Pour marinade over pork chops. 3. Serve with the potatoes!!! 1. Defrost potatoes.2. Combine potatoes and melted butter in large bowl. 3. Add the rest of the ingredients and mix carefully. 3. Bake at 350 degrees for 45 minutes. Mix all ingredients in bowl until well blended. Form 1 1/2 inch balls. I use the medium Pampered Chef scoop. Place on baking sheet. Bake 20-25 minutes or until no longer pink. Place on cooling racks lined with paper towels to catch grease. Once completely cooled, place into Ziploc freezer bags. Freeze. Run cottage cheese through the blender to give smooth consistency. Combine cottage cheese, eggs, and Italian seasoning. Spoon 1 3/4c. Ragu on bottom of 9x13" baking dish. Sprinkle with Parmesan cheese. Cover with a layer of plastic wrap and a layer of aluminum foil. Label and freeze. Thaw completely. Remove plastic wrap and aluminum foil. Bake at 350 for 30 minutes. *You could use store bought meatballs, but you would need to add more if they are small. I feel like the homemade recipe provides a more flavorful meatball, which makes a more flavorful lasagna. ** This is more than a regular size jar of Ragu, but less than 2 jars. I felt like 1 jar wasn't enough, but 2 was too much. I would just use the leftover sauce for dipping garlic bread, or freeze it for later.